Aren’t baby feet the best and most beloved, kissable part? 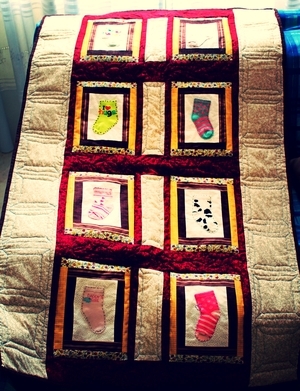 My daughter’s precious socks and the even more precious feet they encased were the inspiration for these grandma gifts. My mother and mother-in-law both live far away. 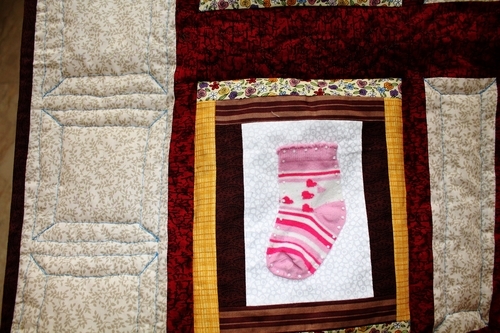 These quilts are a warm, snuggly reminder that they are loved, no matter the distance. baby socks, printed cotton muslin, cotton embroidery floss, polyester batting, cotton and metallic threads.